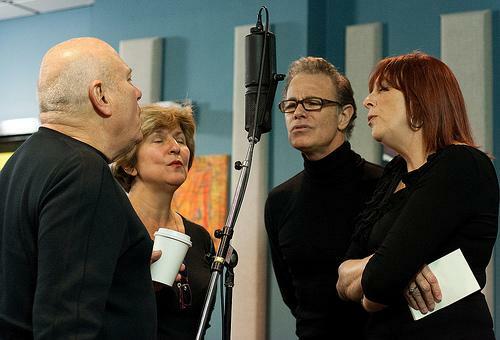 It was all I needed to hear–til this day those first four notes of “Tuxedo Junction” can still elicit the pleasure it did when the Manhattan Transfer released it on their debut album back in 1975. Hearing this matchless quartet for the first time was a jolt for those of us who bounched between AM and FM as we argued the merits of Motown versus Philadelphia soul (when we weren’t blissing out to those soft rock sounds emanating from Geffen/Laurel Canyon land, or the Brits with their art rock). Only the most sophisticated of us (meaning a tiny few) knew of the Mills Brothers, The Inkspots, or Lambert, Hendricks and Ross; eventually I’d get to know these forebearers, but the Manhattan Transfer–they of the sinuous four-part harmony and throwback glamour–was my first taste of a vocal jazz sound that beguiles to this day. Tim Hauser was their founder–the old guy, some of my young friends would say. Didn’t matter to me–in my mind (and ears) they were a package deal, and I didn’t give a damn about appearances. Having caught them at the Time Warner Center a few years back, the “old guy” not only kept up–he was in as good vocal shape as the rest (Alan Paul, Janis Siegel and Cheryl Bentyne, who replaced original Laurel Masse after a car accident in the late 1970s) and still moved with a style that was as authentic as it was energetic.